From the author of World of Pies, a charming portrait of the American heartland as told through the intertwined lives of twin sisters. When Karen Stolz’s World of Pies was published two years previous, readers and critics alike savored every delicious word. Now Stolz returns to themes of childhood and coming of age in a poignant novel about twin sisters. In beautifully rendered detail, Stolz reveals the pleasure of freshly laundered dresses and homemade fudge, the terror of childhood illness and quarrels, and the magical connection that only twins possess. Set against the backdrop of St. Louis during the Great Depression, twins Fanny and Sue tell their charming story in alternating voices. Infused with humor and warmth, Stolz’s latest novel is certain to charm readers eager to experience life the way it used to be. If you thrill to the domestic nitty-gritty of life — what someone wore, ate or listened to — Austinite Karen Stolz’s new novel will pique your interest. If you’re a devotee of the idylls of a storybook prewar America, all the better. If you’re a plot fanatic — well, you’re likely to be left wanting. Like Stolz’s 2000 hit debut, “World of Pies,” “Fanny and Sue” is less a novel than a series of interconnected set pieces, following the twins of the title through the adventures of their Depression-era childhood and teenage years. Told from the alternating perspectives of each girl, these stories evoke the same home-centered charms of small-town existence as “Pies,” despite being set in the big city of St. Louis: This is the kind of life in which Mom rolls biscuits each morning and the girls fashion handmade valentines. Indeed, there’s a sweetness to “Fanny and Sue,” one that will be familiar to Stolz’s fans (even without the recipes that dotted “Pies”). Family dinners, sewing lessons and school dances are all rendered in loving detail, a paean to an imagined simpler time reminiscent of Fannie Flagg’s newest, “Standing in the Rainbow.” Even the family’s financial troubles during the depth of the Depression are tinted by a certain cinematic romance — the twins’ mother rolls those biscuits extra-thin to make extra for the men begging at the back door. That’s not to say there isn’t hardship in Fanny’s and Sue’s lives. Elsewhere, troubles are skittered over and forgotten: their mother’s miscarriage, a cousin’s bout with polio. These bumps in the road are dealt with so lightly that they don’t add the depth that would elevate “Fanny and Sue” beyond a sweet tale. But the confectionlike charm of dipping into a world punctuated by Christmas made special simply by a breakfast plate of bacon is infectious in Stolz’ hands. OK, so “Fanny and Sue” won’t change your life. But it just might make for a delicious Sunday afternoon. Stolz alternates using Fanny and Sue as the narrators, at first it is difficult to keep track of which twin is which, the girls even suspect their father can’t tell them apart, although that doesn’t last for long. Stolz works hard to keep the language simple and childlike, which is not to say childish. It is quite a trick to have young girls at the focus of story without it becoming precious or cutesy. The girls seem real, although I did think their characters seemed set too early on. The girls, outgoing Fanny and bookish Sue, did not really change throughout the story, only the outward manifestations of their personalities changed as they grew. Some may find this realistic, although I found it a bit too convenient. I was reminded throughout the book, of Tony Earley’s marvelous study in minimalism, Jim the Boy since both books tell sweet stories with neither flounce nor flurry. The story is really a collection of anecdotes about the girls in a more innocent time. Popping corn on the kitchen stove, using bluing to whiten the wash, and making homemade fudge may read like science fiction to some. The two girls live with their family in St. Louis, which is where I live now, and is part of the reason I was drawn to the book. It really could have taken place in any big city but Stolz does include a few details about life here; her foreword says she drew on her father’s St. Louis childhood. I don’t know what it says about St. Louis, but most of the institutions she mentions are still alive and kicking. The Fox Theater, the Muny Opera, Crown Candy Kitchen, and Ted Drewes Frozen Custard Stand are all Gateway City landmarks. If you’re ever here, I strongly urge you to visit at least Ted Drewes, purely for its, ahem, historical value. The custard is pretty good too. 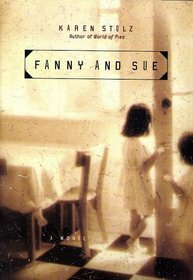 The stories sprinkled throughout Fanny and Sue are at once quaint, wool bathing suits and streetcars, and terrifying, bouts of polio and scarlet fever in the days before antibiotics. She also gives the girls a terrific set of supporting characters, who stay true to the historical time period and more importantly, stay true to the girls. The story may lack a lot of flash and action, but it more than makes up for it in heart. Review: Book takes readers to time of innocence. In this second novel, Karen Stolz returns us to a time of innocence – a time when children not only respected their parents but openly expressed their love for them, too. It was a time when family meant everything. Following identical twins Fanny and Sue Logan during their growing up years in Stolz’s hometown of St. Louis, we soon find that though the girls look alike, their personalities are opposites. From birth to death, the sisters’ strong connection may strain, but never break. The saga from birth in 1920 to death in 2003 becomes an adventurous ride the reader will be delighted to undertake. Choice phrasing and just-the-right amount of historical reference suggest the author might have time-traveled to understand her scene so well. In alternating chapters, the girls take turns in sharing their points of view. Soon, the reader can almost distinguish them by their choice of words; but as with twins in real life, one must peer closer to decide which girl is which. In childhood, one suffers a bout with scarlet fever and one is left with a slight scar – a distinguishing mark but not as important as the differences in budding temperaments. Through the Great Depression, the family reflects experiences of others across the nation. Lay-offs, money problems and hunger afflict the Logans, but they continue to help families worse off than they are. Two families live in a home meant for one and somehow become stronger from the experience. As in her previous award-winning book, “World of Pies,” the Iowa Writers’ Workshop graduate once again scores high marks. “Fanny and Sue” is sprinkled with the tastes, scents and touches of life that draw the reader in for an intimate glimpse of a time of innocence. A book to be read slowly in order to savor the details. World of Pies is one of our favorite books and we recommend it often! I have carried Fanny and Sue with me as I moved to new places five different times. It has always been my hope to find more writings by Karen Stolz. I learned of her passing just recently. I don’t have enough adjectives in me to describe how somber, sad and let down I feel in knowing I will not be able to enjoy Karen’s writing. Her style and skill reached out and grabbed me, making me a forever fan of hers after reading only one page of her writing. I (happily) stumbled upon your books at the local library. I gobbled up World of Pies in one day and really fell in love with Fanny and Sue. You have probably been asked this many times, but will there be a part 2 to Fanny and Sue?? I would love to find out what their adult life was like in California! Does Fanny make it in Hollywood? Does Sue become a teacher? Thanks so much! So happy to hear that you discovered the joy of my sister’s books. It is a shame there will be no part 2 to Fanny and Sue. All of her readers would love that!